MILWAUKEE, WI. 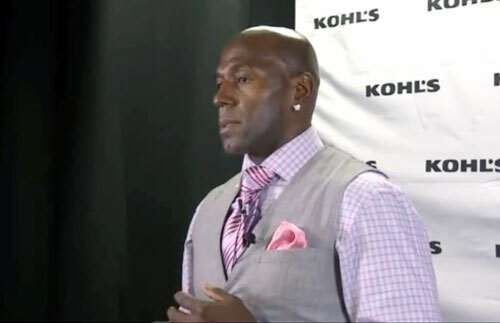 — Green Bay Packers legend, Donald Driver, was the guest of honor on Friday, May 1, where he surprised Kohl’s employees at the Kohl’s corporate office at Milwaukee’s Veterans Park. Donald’s heartfelt speech made an impact on the the audience pumping up the crowd before Saturday’s “Making Strides Against Breast Cancer Walk.” The Superbowl champ, who lost both his father and best friend to cancer, said he is just happy to be able to use his public platform to contribute to the cancer fight. Source: Fox6Now.com. “When you have family that goes through this, you see the ups and downs they go through every single day. It makes you want to continue to fight for them, take some of the pressure off them and put it on your own back. We have to be one team to make sure that day will come where we can say it’s all over and we found a cure for cancer,” Driver said. 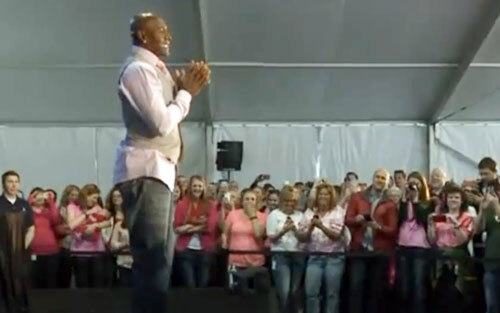 Photo shows legendary Green Bay Packers Donald Driver on May 1, 2015 where he suprised Kohl’s employees at corporate headquarters in Milwaukee before the breast cancer walk event. Watch the great Donald Driver’s inspirational story. Donald Driver is a former wide receiver who played for the Green Bay Packers for fourteen seasons. He was picked by the Packers in the seventh round of the 1999 NFL Draft, and played his entire NFL career for the Packers. Driver is also an author of children’s books, and won the 14th season of Dancing with the Stars. He has an inspirational life story and is an excellent inspirational and motivational speaker.